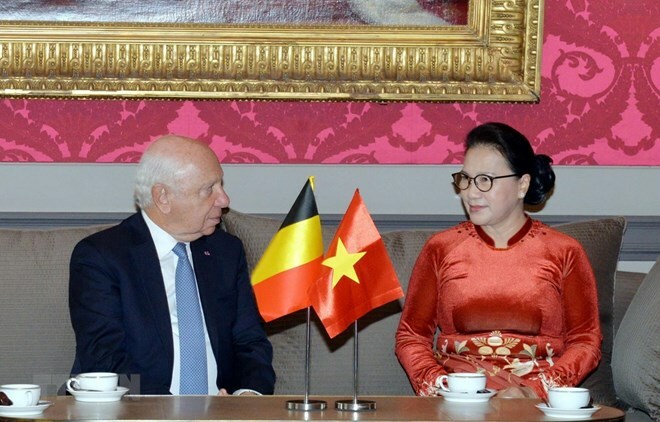 Brussels (VNA) – Belgium wants to strengthen relations with Vietnam and further expand new cooperation fields, President of the Belgian Senate Jacques Brotchi told Vietnamese National Assembly (NA) Chairwoman Nguyen Thi Kim Ngan. During a meeting with the visiting Vietnamese top legislator in Brussels on April 4, Brotchi highlighted the fruitful development of the Belgium-Vietnam relations, especially in university-level education and economic links. He asserted his country’s wish to foster cooperation with Vietnam, adding that the two sides can easily find a common voice in issues of mutual concern. There is great potential for the two countries to forge ties in healthcare, he said, noting that Belgium wants to collaborate with Vietnam in the field, which Belgium is strong. Many Belgian firms hope to extend their investment and operations in the Southeast Asian nation, he added. NA Chairwoman Ngan said the Vietnamese delegation’s visit to Belgium aims to maintain and further bolster comprehensive cooperation between the two countries in general, and their legislative bodies in particular. She briefed her host on Vietnam’s socio-economic development, and the country’s efforts in realising the UN’s Millennium Development Goals (MDGs), especially in promoting gender equality, poverty reduction, healthcare, and education. Vietnam is working to realise the UN’s Sustainable Development Goals (SDGs) towards 2030, she said, adding that Vietnam has issued its National Action Plan to implement the 2030 Agenda for Sustainable Development. Investors can feel secure investing and doing business in Vietnam due to its stable politics and society, she stressed. According to Ngan, Vietnam has trade ties with about 200 countries and territories worldwide. European countries, including Belgium, are big markets for Vietnam. In 2018, two-way trade between Vietnam and Belgium hit 2.8 billion USD. Belgian enterprises operating in Vietnam have recorded strong development in recent years. While appreciating the health cooperation-related proposals of Belgian Senate President Brotchi, NA Chairwoman Ngan said she will convey the information to the Vietnamese Ministry of Health for consideration. During the meeting, the two leaders discussed issues concerning the acceleration of signing and approval of the European Union (EU)-Vietnam Free Trade Agreement (EVFTA). The Vietnamese top legislator mentioned the benefits of both sides in promoting EVFTA, while suggesting the Senate President support and promote the signing of the trade pact soon, towards realising benefits brought by the agreement to Vietnam, Belgium, and the EU. Vietnam has been implementing recommendations from the EU and the European Parliament, Ngan said, adding that the parties concerned had open and straightforward dialogues. For his part, Brotchi spoke of Vietnam’s endeavours in the work and affirmed his support for the EVFTA, saying that he will contribute to promoting the signing and ratification of the agreement.